FILE - House Speaker Nancy Pelosi. On Twitter, Trump said, "Before Nancy, who has lost all control of Congress and is getting nothing done, decides to defend her leader, Rep. Omar, she should look at the anti-Semitic, anti-Israel and ungrateful U.S. HATE statements Omar has made. She is out of control, except for her control of Nancy!" Omar, one of two Muslim women in the U.S. Congress, said Sunday she has experienced an increase in death threats in the days since Trump posted a video critical of her comments about the September 11, 2001, terror attacks. Trump's Friday tweet included Omar's brief line from a recent speech that "somebody did something" in the attack, followed by more than 40 seconds of Sept. 11 video footage and a large graphic repeating the words "somebody did something." ​Omar said many of those threatening her life directly referenced Trump's post. She also cited a rise in violence and acts of hate by right-wing extremists in the United States and elsewhere in the world, saying, "We can no longer ignore that they are being encouraged" by Trump. "Certainly the president is wishing no ill will and certainly not violence towards anyone," White House spokeswoman Sarah Sanders said on the "Fox News Sunday" political issues program. "But the president should be calling out the congresswoman for not only one time but a history of anti-Semitic comments," she added, accusing Omar's fellow Democrats of "looking the other way." Pelosi, who oversees the Democratic-controlled House of Representatives, said the memories of the terrorist attacks on New York and Washington are "sacred ground, and any discussion of it must be done with reverence." She asked security officials to make sure Omar and her staff are protected at the Capitol and nearby congressional office buildings. Pelosi called Trump's video "disrespectful and dangerous," and said it must be removed. 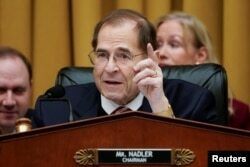 FILE - Chairman of the House Judiciary Committee Jerrold Nadler (D-NY). "CAIR was founded after 9/11 because they recognized that some people did something, that all of us were starting to lose access to our civil liberties. For far too long, we have lived with the discomfort of being a second-class citizen, and frankly, I'm tired of it. And every single Muslim in the country should be tired of it," she said. Nadler said Trump has "no moral authority" for talking about Sept. 11. He accused Trump of "stealing" a $150,000 grant meant for small business owners to rebuild their destroyed businesses after the attack and using that money for his own real estate holding.